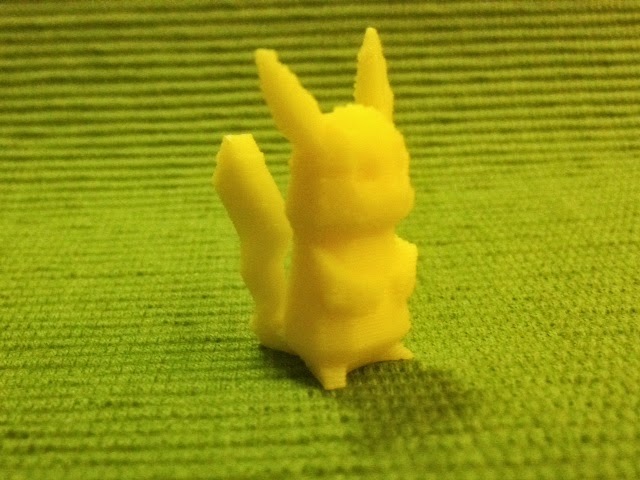 Today's print is FLOWALISTIK's nicely stylized Low-Poly Pikachu model from Thingiverse. The design of this model is great, and just like the ones we printed on Day 282, FLOWALISTIC made very nice choices for the few polygons in the model. We wanted a very small model so we printed it at half size. It's adorable. Pika pi! 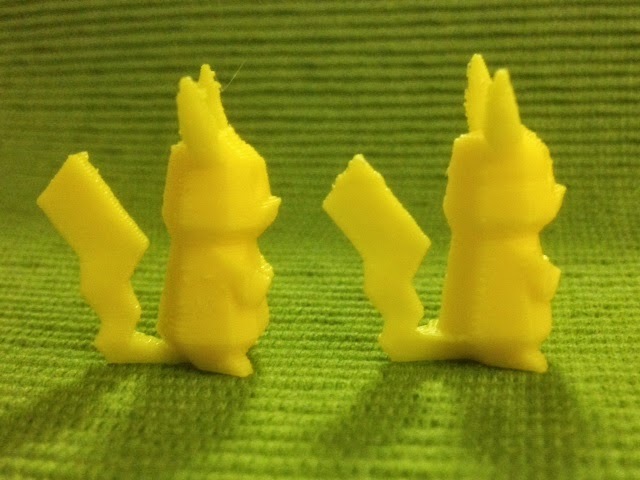 Settings: This model was printed with our loaner Afinia H-Series printer at 50% scale, in beautiful ABS yellow! That sounded really easy when I just typed that but it took me a long time to figure out how to make that work in TopMod, and along the way I tried a lot of other things that failed miserably. In fact, even this was a sort of failure, because adding those three triangles caused some nasty non-manifold problems. I exported from TopMod and imported back into MeshLab so I could run "Remove Faces from Non-Manifold Edges" and a bunch of other stuff from the "Cleaning and Repairing" menu (see Day 148, for example). Even after that, something was still crazy and the model wouldn't slice right, so I went to my last resort strategy and imported the model to Tinkercad, in the hopes that re-exporting the model would magically fix the problem. AND IT DID, thank goodness.